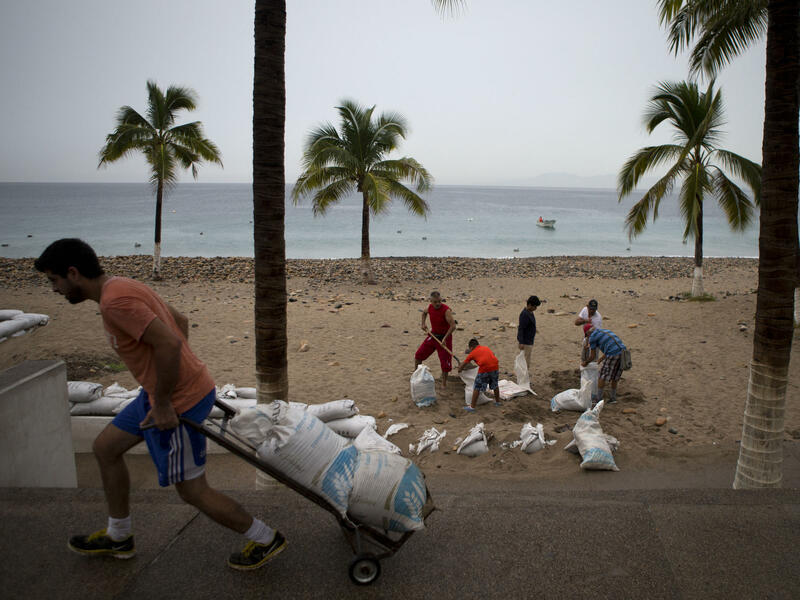 Residents of Puerto Vallarta, Mexico, hauled sandbags on Friday as part of disaster preparations for Hurricane Patricia. The National Hurricane Center says the eye of Hurricane Patricia has made landfall near Cuixmala on Mexico's southwestern Pacific coast. Its winds were measured at 165 mph, somewhat weakened but still a Category 5 storm capable of catastrophic damage. Hurricane Patricia is bearing down on Mexico's Pacific coast Friday. Forecasters say this could be potentially catastrophic. It's a monster storm with sustained winds of 200 mph. That's the most powerful ever recorded by the National Hurricane Center in either the eastern Pacific or Atlantic basin. Thursday Patricia went from a weak tropical storm to a top-of-the-scale Category 5 hurricane in just 25 hours. It's believed to be the fastest strengthening ever observed. And it's likely to get stronger. Some models show the storm could reach sustained winds of 220 mph. That's unheard of. Some have compared this to Super Typhoon Haiyan, which struck the Philippines in 2013. There are some important distinctions between those two storms. Haiyan's winds (either 174 mph or 196 mph, depending on which estimate is used) were estimated using satellite observations. Patricia's winds are confirmed by U.S. Hurricane Hunter aircraft that flew into the storm and measured the actual winds and atmospheric pressure. Patricia is a "small" storm — the most powerful winds don't extend very far beyond its eye, perhaps only about 30 or 40 miles. It's similar in size to Hurricane Andrew, a devastating but compact hurricane that walloped South Florida in 1992. Also, the storm surge from Patricia might not be as bad given the rapid intensification. Still, later Friday, it will smack Mexico very, very hard; rain, flooding and mudslides threaten to be the biggest killer. This is an El Nino event. The storm's rapid intensification is fueled primarily by one thing: very warm ocean waters — 87 degrees where it swirls above. Not only that but the warm waters are very deep, adding more fuel. The number of Category 5 hurricanes in the Pacific basin has been impressive this year, but not unprecedented. Meteorologists and other climate watchers are already asking: "Is Hurricane Patricia what global warming looks like?" Also, as a Category 5 storm, Patricia is at the top of the Saffir-Simpson scale. If the categories went higher (as some have suggested in recent years), it would actually be labeled Category 7. While all of the attention is being paid to Mexico in the short term, there will be impacts to the U.S., too. Once the storm comes ashore, it'll weaken considerably. While the National Hurricane Center says it's possible Patricia will dissipate completely 36 hours after landfall, it doesn't mean the storm will be done. Remnants will make their way across the Gulf of Mexico and into Texas and Louisiana. Some areas in the U.S. could see a foot of rain or more in the coming days.